When you open a book and it starts with the chronology of an entire country, it can be daunting. I’m not the type to remember dates or places, and when this was followed by a “list of characters in order of appearance” and a glossary, I freaked out a bit. I don’t know anything about Persia, I haven’t got a head for history, and there was no way this was going to be my type of book. 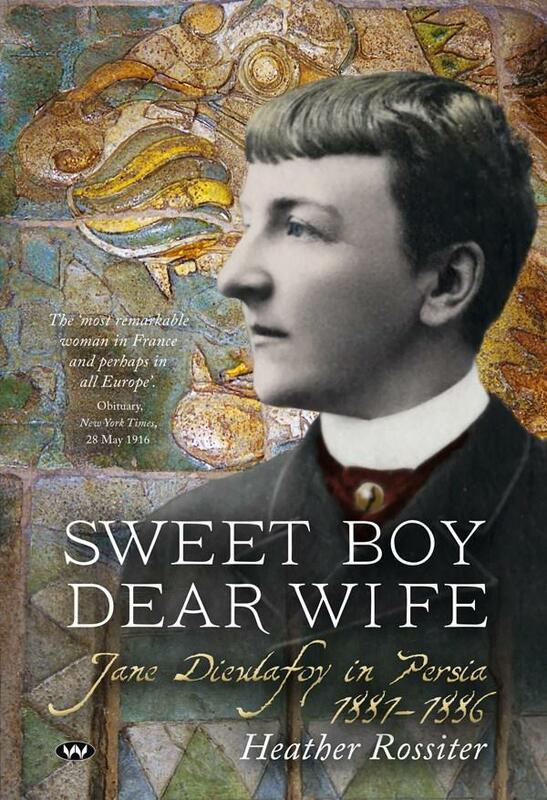 Heather Rossiter’s Sweet Boy Dear Wife: Jane Dieulafoy in Persia 1881-1886 follows the trials and tribulations of Jane Dieulafoy as she travels through Persia with her husband on archaeological digs. For safety, Jane spends most of her time dressed as a boy and being referred to as ‘young master’ fooling almost everyone. Jane’s obituary in The New York Times called her the ‘Most remarkable woman in France’ and given her story, it’s no wonder Rossiter felt compelled to tell it. The enamelled brick friezes that Jane discovered in the ancient city of Susa are displayed in the Lourve to this day. After I found the first few pages so daunting, I was happily surprised by the first chapter and then the rest of the book. Rossiter’s writing, despite being dense with information, is incredibly readable and very accessible. Based on Jane’s diaries, much of the strength comes from Jane’s emotional attachment to Persia and its people, which Rossiter has managed to keep intact. Throughout the book, there is a particular focus on the women of Persia who are so in contrast to Jane. While Jane hides herself as a man out of necessity in Persia, in her home country of France she is not only essential to her husband’s work but becomes successful in her own right. She also wears trousers, a real statement in that era. The Persian women that the Dieulafoys encounter are often disrespected and reliant on the men in their lives. There are, of course, exceptions to this throughout, but no spoilers! Without Jane’s attachment to the country, which under a less talented writer could have easily been missing, its history would not have been as immersing as it was. Persia’s history is interspersed between Jane’s adventures and her own musings and is connected to these in a seemingly effortless way. Rossiter’s expertise in Jane’s life, Persia’s history and in writing non-fiction is apparent throughout the book. Although readable, Sweet Boy Dear Wife is jam-packed full of information. This is not a book to read if you’ve got a lot on your plate and might be easily distracted. It requires a lot of concentration and if you’re like me and can’t remember dates and places, you’ll be constantly flicking back and forth between the front section and wherever you’re up to. The information Rossiter provides is amazing and presented in a very digestible way, but there’s still a lot of it. If you’re at all interested in fascinating and pioneering women, Sweet Boy Dear Wife is an excellent read. You’ll not only learn about the incredible life of Jane Dieulafoy, but also the rich history of Persia. Having said that, this is a book you have to make time for, so it’s maybe best saved for your holiday. This entry was posted in Books and tagged book review, lip lit, literature. Bookmark the permalink.